This week is (amongst other things) Real Nappy Week, designed to help get people talking about – and using – cloth nappies. It’s also a week awash with offers, promotions and competitions amongst the many cloth nappy manufacturers, enticing hapless addicts like me into wanting more pretty prints for the stash. Cloth nappies these days are very different to the terries and safety pins of our parents’ day. And in fact they’ve moved on a lot even in the last 4 years since I used them for G. They’re easy to put on, easy to wash and quick to dry. With summer coming up it’s also been shown that despite the layers of fabric cloth nappies keep baby one whole degree cooler than disposables – and as they’re so cute they can run around in them without needing anything on top! This week I’m posting on Instagram and Twitter a daily photo of our pretty cloth nappy choice of the day – our first 4 days are in the pic above. And I may have ordered a few new ones as well. I’m also working to set up a local cloth nappy library, to allow parents to try real nappies without any risk. If you haven’t tried cloth nappies yet, get involved this week and give it a go. A good place to start is Go Real, The Nappy Gurus, or check out some of the bloggers trying cloth for the first time. 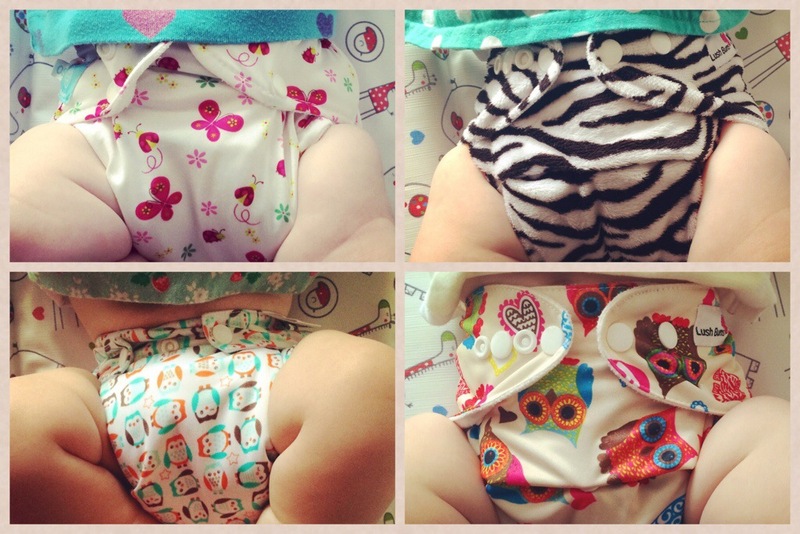 We’re cloth nappy fans too and I think I spy a Baba and Boo in there? We don’t and won’t use anything else now! We are on day three of using them. We’ve had one leak (overnight) so I’m putting him in disposables for night time. I really like them. We’ve bought some fleece liners to use instead of disposable ones, and some pretty wraps. We’ve gone out for the day using the reusable nappies, but when he needed a change we put the nappy in a nappy bag to take home. Is that what normally happens? I’m now wondering if nappy bags biodigrade. Is there a better way to do it? Good work! Takes a little while to find a night nappy that works for you, def the hardest bit! But even using disposables overnight you’re saving tons of money and reducing waste, so well done! Fleece liners are great too. We sometimes use nappy bags but I have a selection of wet bags which are great – they’re made of waterproof fabric with either a drawstring or zip (zip seems best) which you shove the nappy in and then stick in the wash with your nappies. You can get small ones to fit a single nappy or bigger ones that hold a few. You can even get wet/dry bags which take your dirty ones on one side and clean ones on the other!